BPS Nail Foil - Polish This! I have wanted to try out some nail foils for so long that I can't even remember, but somehow I've never done it before this. Actually, I didn't have any foils to try before I got this one from Born Pretty Store to test. They have 27 different colors and styles of foil and I chose the foil number 17* which is kind of a gradient with gold, red and magenta. However, I still don't own any nail foil glue, so I didn't even want to try to do my whole nails with the foil as I've heard it might be difficult without the glue. 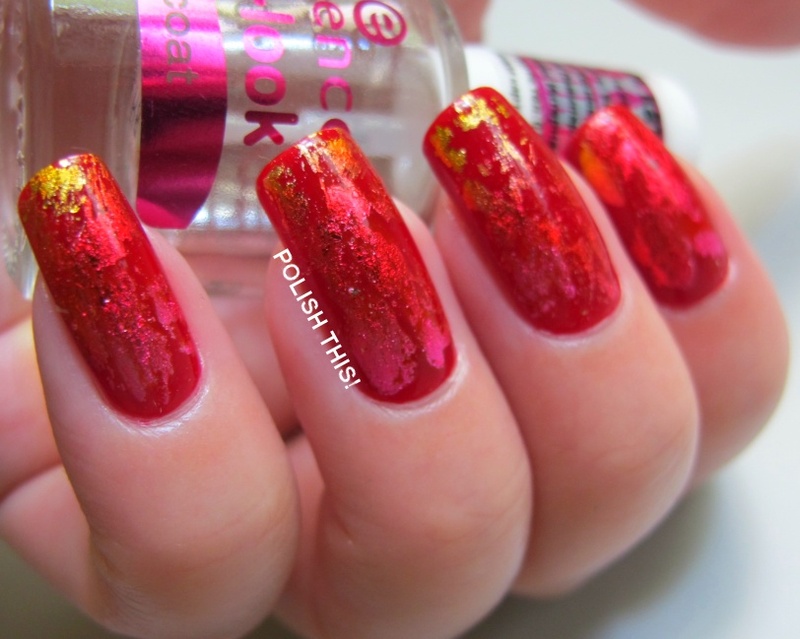 Still, I really like the look I got with a base color, some top coat and the foil. 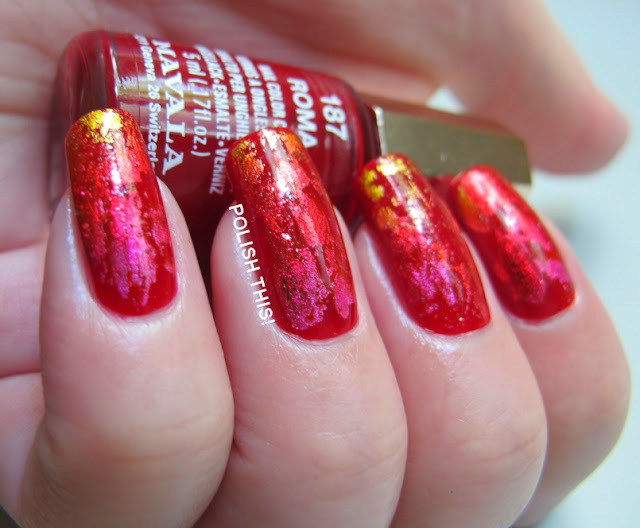 I used Mavala Rome** as my base color for this mani. When it was completely dry, I dapped some Essence Gel-Look Top Coat irregularly on my nails and then placed the foil over it (the colored side up) and rubber it on with my fingers. Then I just removed the foil and that's how it got this nice shattered look. Of course I used also some top coat over the foil to make the mani last longer. 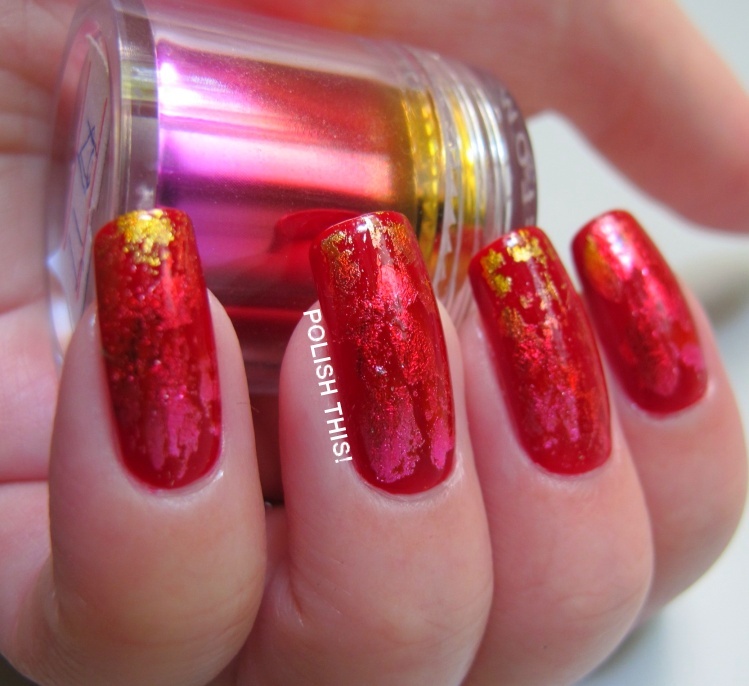 This look was pretty easy to do with just the polish, top coat and the foil, but you really need to be sure that the base color is completely dry, because otherwise it can all come off when you try to remove the foil. The foil comes in a little container like this and there's quite much of it, so you can do more than one or two manis with it (depending of course on the amount you use for one mani). I'd really like to try out more of this and maybe combine couple different colors of foil to one mani. I should also buy that nail foil glue, so that I could try out the whole nail look with this, though I think I might like it more this way. Don't forget you can get 10% off everything from BPS with my code MBL91. *The nail foil was sent for me to review, for more information see my disclosure policy. **I got Mavala Rome from goodie bag from our meeting. you don't even need the glue :) I tried these too and they worked great on the whole nail without glue, it almost looks like little mirrors. I just didn't let the base dry completely. 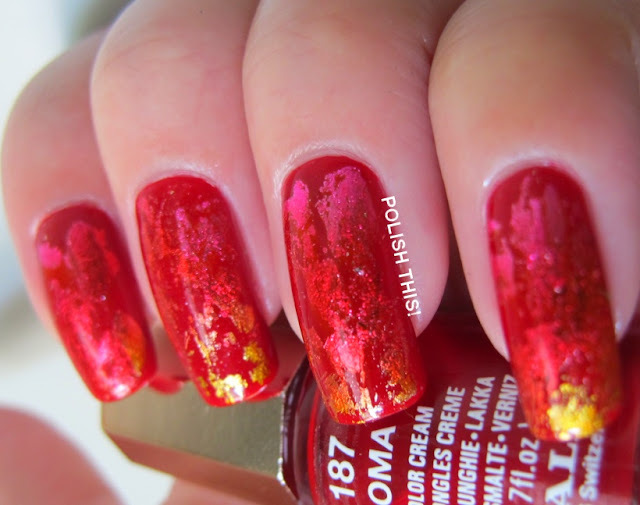 maybe you like to take a look at my blog and my foils :) love the shattered look, too! I tried to do the whole nail with only nail polish and the foil, but somehow I didn't succeed. Maybe I just need to try again, I loved how you had done it! thank you annie! when I remove the foil I rip them really fast, kinda like waxing, not too slow. but yes, sometimes my polish is still too wet and sometimes already too dry - tricky. thank you though for stopping by at my blog. Kylläpä tekee hienon efektin tuo folio. Itsekin oon halunnut kokeilla foliota jo kauan, mutta jotenkin jäänyt sekin homma. Oh my, look at that glow! It's gorgeous!